This post has been patiently waiting for its window of opportunity, but I was keen to write it even if it is a tad late! For Christmas my lovely buddy Emily from blogmebeautiful wrapped me up a real make-up treat in the form of Benefit's Fun-Size Flirts. 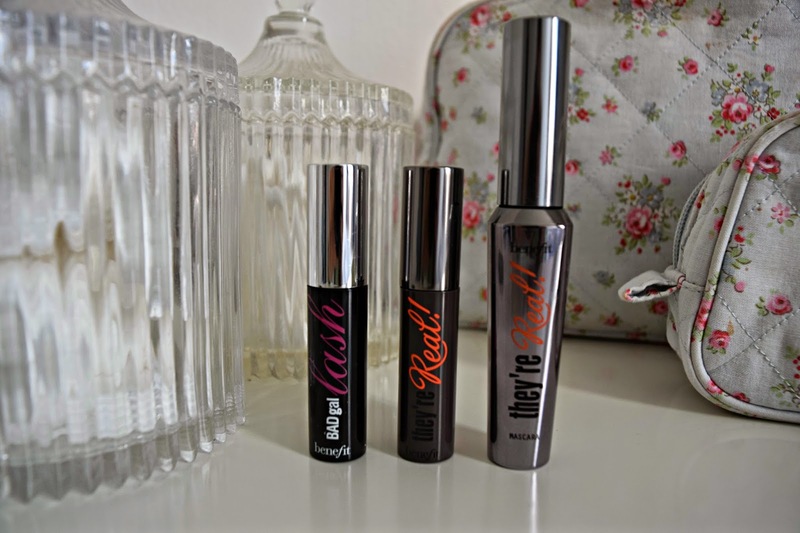 I have been a devotee of Benefit's for years and their products have been my go-to favourite as I know I can rely on them to perk up my look in minutes. The packaging is always really fun and draws me in when I go past their make-up counter in any store! Whenever I go on holiday, I always take advantage of the in-flight miniatures on sale in duty-free, but I've been grounded for a fair while now (for obvious reasons) so my stocks were running low. That was until I finally caught up with blogmebeautiful a few weeks ago and unwrapped this treat. Now, I know I'm not making any great revelations when I say how fab Benefit's products are, but for a first-time mum who has suddenly found herself with no free arm to dangle a handbag from and, thus, no space for a make-up bag, they deserve a review! I've taken pictures with some of the full sized products so you can get an idea of what size they really are: there is nothing worse than ordering miniatures, thinking you've got a great deal and them turning out to be much smaller than you realised! I wrote a few weeks back about my make-up bag heroines, but they are full-size products so don't fit as neatly in the nappy bag (in which I have managed to commandeer one pocket for my bits and bobs) as I need to make them useful for day/evening out top-ups. These beauties, however, are just the ticket. I have only recently discovered the POREfessional, another Christmas treat, and its silky texture means it smooths on easily and hides any unsightly pores, exactly as it promises. "that gal" is also a real treat. The primer brightens my skin (absolutely vital as there is no way it has natural brightness at the moment!) and slicks on as a beautiful base. Ooh la lift has been around for a while, but it feels so refreshing when I pat it under my eyes and tricks them into thinking they are more awake than they really are. All three face products have definitely made the cut and using them forms part of my make-up ritual. Eyes are key to my look so I flit happily between Badgal lash and They're Real and, as a new mum, they bely the few hours sleep I've actuality had making me look far more alert and fresh than I really feel! Dandelion and Posie Tint give a flush of colour, a healthy glow which I've been in love with since they were released, so I'm thrilled to have them ready (along with my miniature hoola bronzer) for a quick polish of my make-up while I'm out and about, although I found the pressed powder much easier to use. There are still a few I have to try (Instant Comeback, sunbeam and Stay Don't Stray below) but, if they are as good as the other Benefit products then I'll be in for a treat. So, thank you blogmebeautiful and thank you benefit for making me look much more polished when I'm out and about than I really feel! New mums could do worse than popping these in their basket when they next do a make-up haul! Although Christmas is now long gone, if you're at a loss as to which products to buy, you can customise your own make-up kit on Benefit's website.